Jay Cutler will be fine, and so will a dynamic defensive line. The question, once again: Can the restocked linebacking corps and banged-up secondary hold up? 1. The Dolphins will be just fine with Jay Cutler at the helm. The best season of his career came in 2015—his only one playing for Adam Gase. Gase’s system employs unique formations and quick-timed routes that inherently instill discipline upon a quarterback. Cutler’s poor decisions and deficient mechanics tend to come late in the down; Gase’s system will have Cutler getting the ball out early in the down. 2. This may seem like a highly specific item, but it’s what defines Adam Gase and the Dolphins offense: unbalanced 3x1 formations. That is, a formation with three wide receivers to one side and a tight end alone on the other. No coach loves any formation as much as Gase loves this one. The unusual receiver distribution reveals whether the defense is in man or zone coverage. It also creates opportunities to either flood the field (i.e. put three routes to one side, where you can then high-low specific defenders) or set up downfield crossing patterns. Two other things the Dolphins do out of 3x1 sets: wide receiver screens (especially when it’s second-down-and-long), and downfield switch releases, with receivers crisscrossing their paths on deep patterns (usually Kenny Stills is involved). 3. There was just one problem with the Dolphins’ 3x1 sets in 2016: They had no tight end threat, and so Ryan Tannehill almost never threw to the weak side. That’s why Miami essentially traded left tackle Branden Albert to Jacksonville for Gase’s former Broncos weapon Julius Thomas. 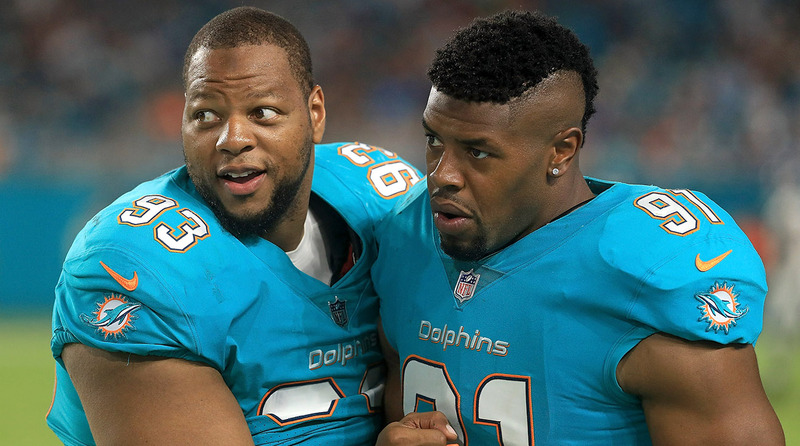 With Suh and Wake, the Dolphins' front four is in good hands again. ​4. The Dolphins also felt comfortable moving on from Albert because Laremy Tunsil was going to supplant him at left tackle anyway. Tunsil’s athleticism is unbelievable. On one play last year he went the wrong way early in a play and still got to his landmark on time. With a specimen like that, the Dolphins should be even better in their staple wide receiver screen game—at least on screens to the left, where Tunsil can get out in front on the perimeter. 5. More specifically, the Dolphins are a zone running-based offense. You wouldn’t think that fits tailback Jay Ajayi. In fact, at first, the 229-pound back himself wasn’t sure it would. Speed, which Ajayi lacks, may seem important in a zone scheme, but it’s ancillary to your ability to plant a foot and cut downhill. Here, Ajayi thrives. And once he gets rolling downhill, he’s extremely difficult to tackle. 6. The Dolphins have put themselves in a great spot at defensive end. Cameron Wake is 35 years old and 22 months removed from tearing his Achilles. But, amazingly, he’s every bit the pass rusher now that he was in 2012. He plays incredibly low to the ground. Part of why he remains fresh is his snaps are mostly limited to pass rushing situations. Wanting to maintain this, the Dolphins re-signed the much-improved, long-bodied ex-Jaguar Andre Branch ($16.8 million guaranteed) and added ex-Ram William Hayes, who can shed blocks in traffic. First-round pick Charles Harris will join Wake on those passing downs. New defensive coordinator Matt Burke plans to play a lot of straightforward zone coverage. You need disruptive edge-rushers in order to do that. ​7. Burke already has two disruptors inside. One you know: Ndamukong Suh. No one is better at wearing down blockers over the course of a play. The other, only Dolphin fans probably know: Jordan Phillips. He has the size to play nose shade (the gap between the guard and center) and the quickness to cross over a blocker and penetrate. 8. Despite having such formidable defensive tackles, the Dolphins ranked 31st in yards per rush allowed last year, which tells you about their linebackers. It’s no surprise that longtime Steeler Lawrence Timmons was signed in free agency, and that Ohio State’s Raekwon McMillan was drafted in the second round. Changes were needed. The question is, with McMillan now gone for the season with an ACL, can Timmons still prosper in nickel? He did in Pittsburgh, but the Dolphins wouldn’t have drafted McMillan so high if they didn’t think he could play every down (which implies that they weren’t sure Timmons could). Because remember, the other nickel linebacking spot, presumably, will go to Kiko Alonso. Even though Alonso isn’t always the most aware player, he has superb range when operating in space. 9. The other position that hurt Miami in 2016 was safety. (Between that and the linebackers, this defense was vulnerable up the middle.) Rangy playmaker Reshad Jones is back healthy, but this season he might have to play more in centerfield, rather than in the box where he’s most dynamic. Free agent pickups Nate Allen and T.J. McDonald (suspended the first eight games) are better strong safeties than free safeties. ​10. We forget sometimes that when backups are forced into the lineup, the increased playing experience makes them better. That’s what happened with cornerback Tony Lippett in 2016. It’s a shame he’s out for the season now (Achilles). Fortunately Cordrea Tankersley was drafted in the third round. If Byron Maxwell has as many ups and downs as he did in Year One with Miami (and remember, Maxwell was traded to Miami because he had too many ups and downs in Philadelphia), could Tankersley get the starting nod opposite Xavien Howard?